Blade Runner 2049 hit Edwards Theater last night here in Idaho Falls. A few of us from The Group Real Estate were going to go. 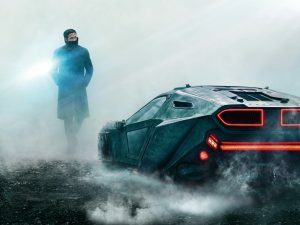 With the cult status of the original Blade Runner (see my previous post discussing the merits of Blade Runner, the run around it had, and the many different versions of the film you can watch), a future noir film set just two years from now, our own future to be seen, was a great film that we all, either grew up loving or hating, but was always in our mind. It was always talked about. It took on such a piece of film making that it inspired other futurism films, such as Dark City and The Matrix. The cult status, and following, of Blade Runner is astonishing, with so many different posts, forums, debates, vlogs, videos, and blogs on the ideologies and humanistic qualities of this film. 30 years later, enter Blade Runner 2049. A sequel, that simply uses the timeline, and proper years from the original film, as it’s name so we know exactly when this is. Drenched in seepy neon, just like the original, but updated in such a beautiful way! The original Blade Runner is beautiful, still to this day. 4k transfers of the original film are the best transfers created. One thing Ridley Scott did so well, was use originals. He didn’t rely on computer imaging (which was terrible back then anyway), and used miniatures, built sets, and created a very dark, drenched, dirty and neon riddled Los Angeles. Roger Deakins does his greatest work here, in his direction of photography. This is where my snobbery comes into play full swing. 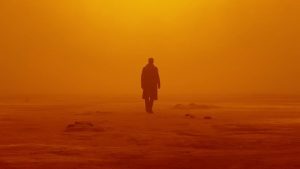 Roger Deakins has been nominated 13 times for best cinematographer in his INCREDIBLE career of being behind the camera and created the most beautiful shots we have ever witnessed in film. From Sicario, to Prisoners, to True Grit, to being nominated for 2 movies in the same year when he was director of photography on both No Country For Old Men and The Assassination of Jesse James By the Coward Robert Ford (probably the most beautiful looking movie in history! ), to Fargo, and his first with the master work Shawshank Redemption. Deakins has made a staple name for himself being behind the camera. Here, he outdoes himself. If the Academy doesn’t give him the win, outright, the politics in film have become too dank. The use of fully created sets, color schemes that are a treat for you eye, and sound design added to this make the sensory part of the film the greatest win. On from that, I won’t say too much here, as it is something that needs to be witnessed and seen. It does the exact same thing that the first film did, with no reason to say there will be more or that they are “creating a universe”, like every other single franchise out there these days. It leaves many open ended questions, many things are left undone and we don’t know what heppened as it finishes. These are what true film are made up of. It is what helps our minds continue to think on them, to discuss them at length, to want to go back for multiple viewings. Blade Runner 2049 also brings Harrison Ford back in a magnificent role here. The travesty of him not being nominated for Episode VII two years should definitely have the wrong writ here with his performance as Deckard. Broken. Sad. Tired. And still the toughest Blade Runner around. His performance is subtle and amazing. Side note, this film also contains the coolest scene I have seen, bar none, in a film this entire year! Please, please see this film. And not only see it, but make sure that you go to Edwards Theater and see it. The beautiful scale of it all needs to be seen on the big screen. The sounds need to be heard from digital, loud, big speakers. The score needs to be punctured into your heart and soul there in the loud theater. If you can go to an IMAX and see it, all the better. This isn’t just s movie. It’s not one to sit down, enjoy popcorn, and just laugh and have fun. This film will test you. It will floor you. And it will make you question your own humanity. It’s sensory overload in it’s purest form. And it is, hands down, the best film I have seen this year.